The Mooseys London Team visited Beth Chatto's Gardens on a late autumn day. The website manager's mother shopped in the nursery for bedding shrubs while we walked around the extensive gardens. We had a cup of tea in the cafe, then left as the sun set. 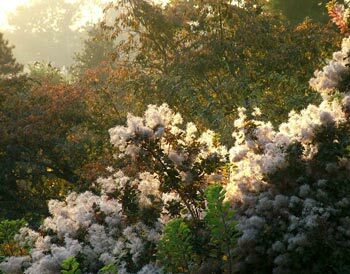 The Beth Chatto Gardens began in 1960 and are famous throughout the gardening world. Beth Chatto publishes books on gardening in different environments and soils, based on her findings in her garden. Now that I know how close to my house it is, I'm sure we'll call in and see the garden transform through the seasons. Tour the gardens, or order plants and books by Beth Chatto. A detailed article about the gardens and plants, by the RHS. The Beth Chatto Gardens started as an overgrown wasteland with poor gravel soil and boggy hollows. It has been transformed into an informal garden, with specialist garden area, such as the gravel garden for dry plants. 'We shut at 4.30 - today is the last day we're open this year,' the lady in the little ticket selling booth said. With the sun setting and 30 minutes of light left, we left the website manager's mother in the garden center and head for the Beth Chatto's garden.